New York Post June 2nd 2013 : Our Middle Eastern “allies” and foes alike eradicate thousands of years of Jewish and Christian heritage. Our diplomats treat the persecution as a minor embarrassment, best ignored. A thousand years ago, there were more Christians in the Middle East than in Europe, and Jewish communities prospered from the Nile to the Tigris. Even a century ago, more than 20% of the region’s population was Christian, and Jews still adorned Arab cities with their talents. But all they possess does not suffice for Islamist fanatics. Israel must be blotted from the earth, and the last Christians must be driven out. This is an old, old story, nearing its end. 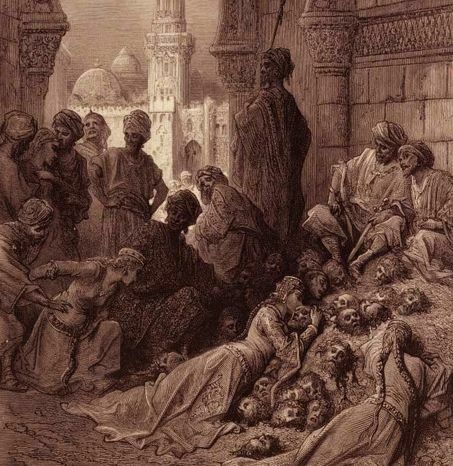 We shroud it in lies to excuse ourselves from taking a stand, even accepting the preposterous Arab claim that Muslim failures today are the fault of the Crusades, a brief interlude when Christians occupied a coastal strip hardly larger than Israel. In fact, it was the Mongols, then the Muslim Turks, who shattered Arab civilization. And as for conquests, Muslims occupied Spain in all or part for 800 years — and brutalized the Balkans for half a millennium. The Crusades were hardly a burp. We also accept extravagant claims that “civilized” Arabs rescued the classical texts that formed our civilization. That’s utter nonsense. The Arab hordes that burst out of barren Arabia in the 7th century were composed of illiterates. Conquering at a time when the warring Byzantine and Persian empires had exhausted themselves, the new rulers found that tribal practices didn’t suffice to run provinces. So they took over the existing bureaucracies, staffed by Greek-speaking Christians and Jews. It was those officials who saved the Greek classics for Europe’s future Renaissance — and their descendants designed Islam’s greatest monuments. Yes, some Arab rulers came to value learning — but the Arab world never produced a Homer, Plato, Sophocles or Thucydides whose appeal transcended their culture. Islam was a religion spread by war. It was only a “religion of peace” where it had conquered. True, Islam sometimes proved more tolerant of minorities than Europeans, but that was at the zenith of the faith’s power.